The Perrin name is famous in the region of Ch�teauneuf-du-Pape, but it's the Perrin brothers at Beaucastel who garner much of the attention for the region. The Roger Perrin winery is a simple building, not a grand manor or chateau. While the other Perrin's get all the fame and attention from critics such as Robert Parker for their "Beaucastel" wine, I've dubbed this Perrin's estate as "No Castel." 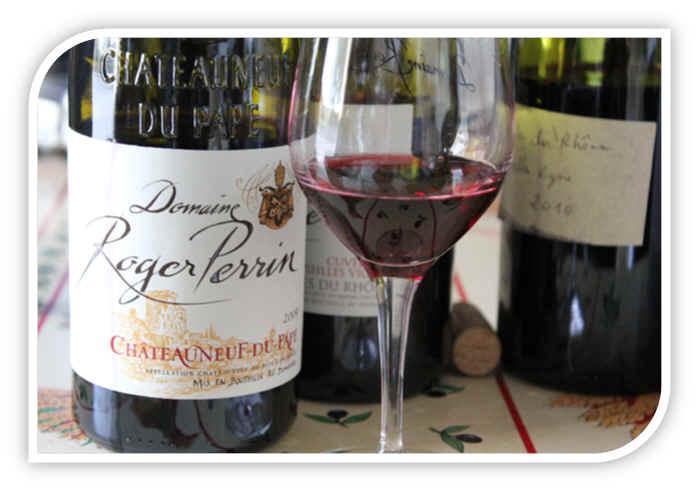 The Roger Perrin domaine had been run by Luc Perrin. Sadly, Luc had been battling cancer the past couple of years and passed away in August of 2010. His wines have been routinely good. They began bottling wine in the 1969 vintage, but the Perrins have been growing grapes since the early 1900s. There are about 40-something hectares of vines presently. About 15.5 hectares are in Ch�teauneuf-du-Pape, 20 are in the C�tes du Rh�ne and 7 are simply "vin de pays." Grenache is the predominant grape. There are various varieties, though, planted throughout Perrin's holdings. Perrin makes a range of wines. We've had delicious white and red C�tes du Rh�ne wines and currently have his elegant and refined 2014 Ch�teauneuf-du-Pape. It is drinkable now and will cellar well. The vintage is not one which produced huge, deep wine, but there's a refinement to this wine which will satisfy most tasters, save for those who've grown accustomed to 15+% alcohol California wines. For those tasters, this will taste "light." I've been fortunate to visit Perrin's estate a couple of times. The first time he asked if we wanted to taste an older wine. Of course, "no" is not in my lexicon, so Luc went off to find an unlabeled bottle. He opened it and poured the wine, not telling us the vintage, but insisting we try to guess. I took a sniff of its magnificent, truffley bouquet and a few seconds later blurted out "1978!" It was, indeed, the 1978. On my second visit to this estate, we tasted all sorts of tank and barrel samples. Again, Perrin asked if we'd like to try an older bottle. I swirled the wine, inhaling the lovely bouquet and thought it's the 1981. Perrin started talking about the vintage, noting "it was not particularly fine..." I didn't want to be thrown off the track, so I said "I think this is the 1981." Bingo! Anyway, Luc Perrin made delicious wine and his importer adds an honest mark-up, so this wine arrives at an attractive price for consumers. The 2013 is a medium-bodied wine and it's quite drinkable now. It is not the alcoholic fruit bomb so highly prized by some of the critics. Nor is it out of balance and hugely tannic and astringent. The Cotes du Rhone Blanc is a winner...It's got a healthy percentage of Viognier, along with Grenache Blanc, Roussanne and Marsanne. We have the 2015 presently. Luc passed away in late 2010...so we were unsure as to what direction the domaine would take. Would the family sell off the property? Or what? We were most pleasantly surprised to visit in the Spring of 2011 and meet Luc's sister, Veronique. 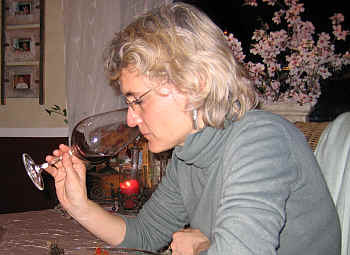 It seems Veronique is an enologist in her own right and she founded a prominent wine lab in the northern Rhone Valley many years ago. 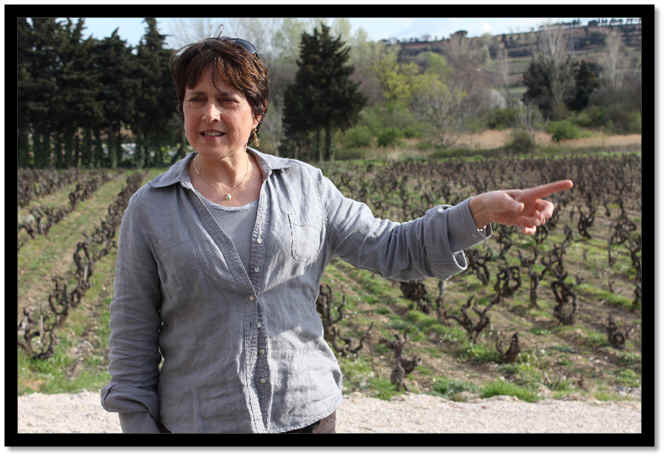 She's well-respected by numerous prominent winemakers and she has taken over running the family domaine in the southern Rhone. Of course we're so sad about Luc, but it is great to see the winery and vineyards are in the hands of a capable manager. 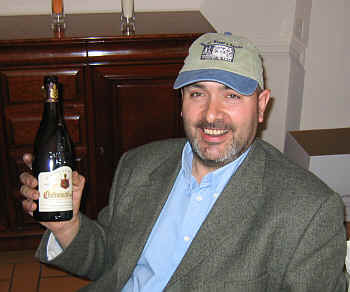 The late Luc Perrin in 2008...Nice hat! This is a very well-run estate featuring vineyards in the Tavel and Lirac appellations. When we first visited the estate some years ago, we were driven around the Tavel appellation by the very enthusiastic Christian Amido. He passed away not long ago, but his spirit lives on as the winery is run by his daughter, grand-daughter Amandine and Amandine's beau, winemaker Antoine Berthaud. 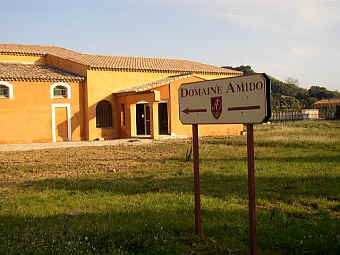 Amido was especially proud of their vineyards and the rather rugged terroir from which his wines were born. We've been especially fond of the Amido Tavel Ros�, a dry, deep Grenache Rose and we've enjoyed the challenge of helping taste various tanks in the winter to assemble just the 'right' blend. Tavel was the first appellation in France for a ros� wine and it still remains the "top dog" for many connoisseurs of pink wine. It was supposedly a favorite of Louis XIV in the late 1600s and Philip "Le Bel" in the late 1200s and early 1300s...and here we are, centuries later and still finding Tavel to be a worthy wine. We currently have the 2016 Tavel in stock and it's delicious! Lots of berry notes and ripe, fresh fruits. Dry. Of course. 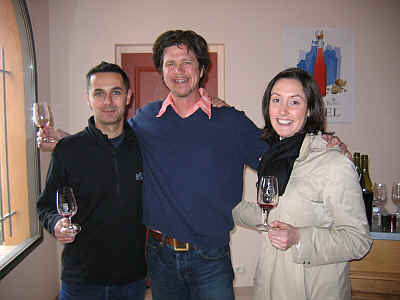 Antoine, importer Charles Neal and Amandine. A vigneron from Burgundy was vacationing in Provence some years ago and was biking around the southern Rh�ne with his grand-kids. He was enchanted by this property and ended up purchasing it as a vacation home. Hard to believe if one lived in Burgundy, they'd want to leave, but perhaps one does tire of drinking great Chardonnay and Pinot Noir. 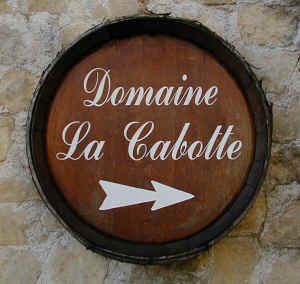 Today the La Cabotte estate is run by Marie-Pierre d'Ardhuy-Plumet together with her husband Eric Plumet. We visited the estate a number of years ago and found the wines to be perfectly standard and well-made, if a bit unexciting. We've noticed a dramatic improvement in the wines over the past few vintages and the past few vintages have been truly "serious." The Grenache in the 2014 vintage contributes a wonderful berry note and a mild spice tone. We understand there's a small percentage of Syrah here and perhaps Cinsault and Carignane. Whatever the blend, they've nailed it and you'll have trouble finding a more soulful ten-buck bottle of red wine. Don't miss this, as it's a good follow-up to the well-received previous 9 or 10 vintages. The Verzier family has lived in the Northern Rhone village (if you want to call it a village) of Chavanay since the early 1800s. 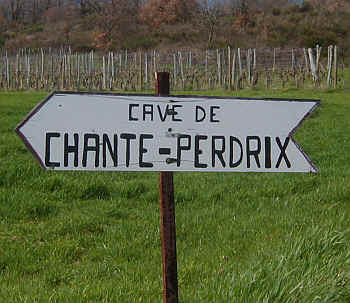 Their estate should not be confused with the Southern Rhone Chante Perdrix in Chateauneuf. It's run by Philippe Verzier, a 40+ year old fellow who qualifies, in our view, as an "old timer." That's because he's been making wine for more than half his life, vinifying his first crop in 1988! Philippe's father had cultivated the property using organic farming principles, not as a selling point, but simply because he felt that was the best way to grow grapes. Dad also grew grain and fruit (aside from grapes) and sold his Syrah to a local grower's cooperative. Philippe's Pop, though, passed away suddenly as a result of a heart attack and so Verzier found himself suddenly confronted with the impending 1988 harvest. What to do? Sell the grapes to the co-op or make wine??? He chose the latter route and today the domain has holdings in Condrieu, St. Joseph and a patch of Syrah just outside the St. Joseph appellation which takes a "Vin de Pays" designation. On a visit to the cellar many years ago, I saw a funny-looking wine tank and inquired about its contents. Philippe said it was merely a "Vin de Pays," coming from vineyards he owned which were near the cellar, but outside the delimited area of Saint-Joseph. We had a taste and it was a lovely, fruity, simple wine. It was a bit like Beaujolais, but had the character of Syrah. Monsieur Verzier's importer brings us some most vintages. We currently have the 2010, a deeply-colored wine teeming with berry fruit and some of the green olive-like notes of youthful Northern Rhone Syrah. We are able to offer it for a price less than cru Beaujolais. In tasting numerous California Syrahs from small wineries, we've found few which capture the character of the Rhone Valley...and none the price of this baby. Don't except a wine of Cote-Rotie complexity, but if you appreciate the character of Syrah from Cote-Rotie, Hermitage, Saint-Joseph and Crozes-Hermitage and you're capable of enjoying a simple, easy-drinkin' version, you might be pleasantly surprised by what you find here. We currently have the 2010 vintage and it's delicious! Condrieu is a tremendous appellation and a very prestigious wine these days. Years ago, hardly anyone outside of the Northern Rhone paid any attention to Condrieu and its lovely wines made of the Viognier grape. 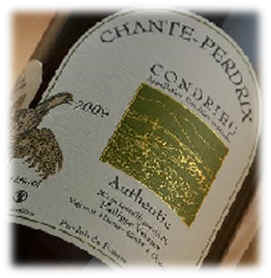 Philippe actually lives just above his Condrieu vineyards and he produces a tiny amount of a rather nice example. The sub-soil is granite, in case you're taking notes. We have a few other bottlings in the shop in which the oak barrels play a great role, but Verzier's wine, though a percentage is matured in wood, tastes purely of the grape. The 2010 just arrived and it's dry and nicely crisp. It's not as big a Viognier as those with all the wood, but still displays good varietal character. If you're having some prawns, crab or lobster, this might be just the ticket! The 2009 Saint-Joseph is exceptional and worthy of comparison with names such as Graillot, Combier, Gonon and the like. It's a fine bottle of Syrah, coming from 20 year old vines. He de-stems about 70% of the fruit, leaving some stems in the fermentation tank. The wine is dark in color and has a wonderfully Syrah-like fragrance with notes of blackberries, herbs, underbrush and some spice. It's a great partner for lamb, duck or well-seasoned stews, etc. Unlike so many French wineries which claim to have a history dating back several centuries, the Joncier estate is fairly new. It was founded in the 1960s by Pierre Roussel and today his daughter Marine runs the place. Winemaking wasn't in her blood, though, initially. She actually worked as a graphic artist before finally deciding her creative talents might be put to good use by managing the family vineyard and cellar in the Southern Rhone town of Lirac. 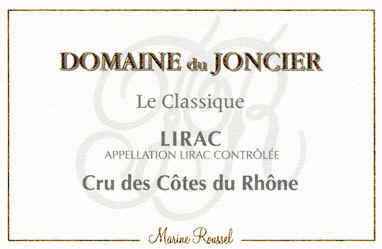 We found her 2010 Lirac, dubbed "Le Classique" to be, well, classic. It's a terrific blend of Grenache, Syrah and Mourvedre with a dollop of Cinsault and Carignan. The wine is fairly dark in color and the Southern Rhone spice notes are a delight showing berries, a touch of pepper and a faintly earthy note. If dinner features some sort of lamb dish, this will be a fine accompaniment. We had a memorable visit with the charming Laurence Feraud, stopping in unannounced one warm spring afternoon. This 32 acre property has parcels in three different areas of Ch�teauneuf-du-Pape, with many old vines, some dating back to the turn of the century. The winemaking is very traditional. They don't use much sulfur and they supposedly do not fine nor filter their wines. The wines are matured in old, huge wooden vats or foudres. Though the property is rather old and Monsieur Feraud has been making wines for years, they used to sell most of the production to n�gociants. With the help of his daughter, Pegau now bottles its own production. We have had many vintages of Pegau and find the wines to be consistently good. The "normal" bottling of Ch�teauneuf-du-Pape is often our favorite. 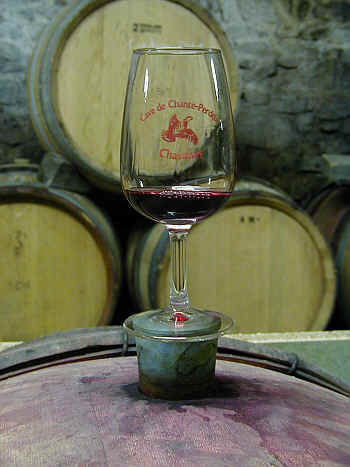 The special bottlings, such as Cuv�e Laurence, are bigger, more intense and alcoholic wines. Showy? Sure. Better? Not necessarily. The 2012 regular bottling is medium-full bodied Ch�teauneuf-du-Pape. We've encountered a mildly spicy quality in this wine and there's a faintly gamey note, too. It's the sort of wine which pairs handsomely with lamb or duck. Decanting it and allowing it to breathe for an hour or two is a good idea. This 59 acres property is owned by Yves Cheron. You'll see the "Montmirail" name on a number of Gigondas estates and this is done to keep American wine drinkers thoroughly confused. This estate's wines, though, arrive at a reasonable price and the several vintages we've had in the shop have routinely been popular enough that we see customers start with one bottle and return for 6. The spectacular Dentelles de Montmirail. 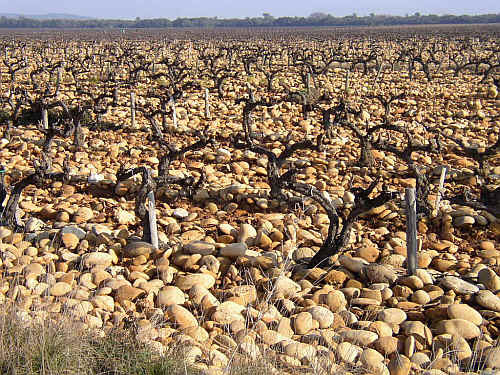 The pebbly soil allows for good drainage and forces the root system of the vine to plunge deep into the earth. 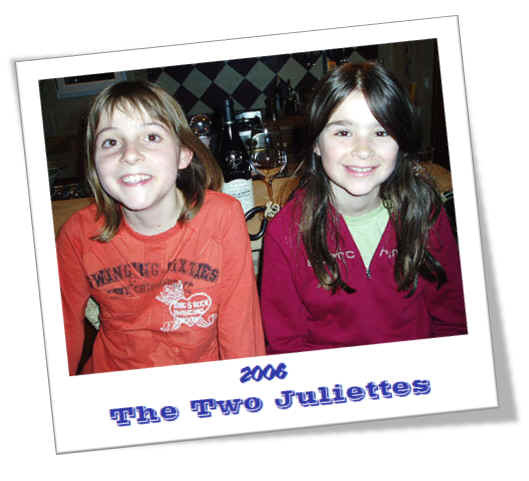 This bottling is named "Les Deux Juliettes," after the daughters named Juliette of Monsieur Cheron and importer Charles Neal. Old vine Grenache (if 40-50 year old vines qualify for this designation) accounts for 80% of the blend. The balance is 15% Syrah and 5% Mourv�dre. The current vintage, 2013, is exceptionally drinkable, showing lots of typical berry and spice notes. Medium-full-bodied. It will cellar well for another 3-5 years (at least), but it's so good now...we're not waiting! The 2010 Vacqueyras is the "usual" Yves Cheron wine: supple tannins and a medium-bodied red with some dark fruits and a hint of berry and spice. It's not a complex Rhone wine, but it is a satisfying accompaniment to stews, daubes, grilled lamb, etc. 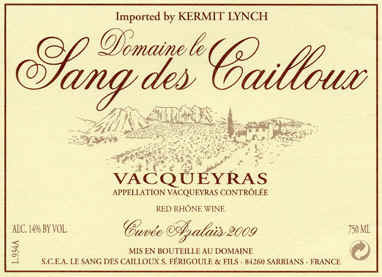 The Sang des Cailloux estate was a small domaine run by the Ricard brothers. 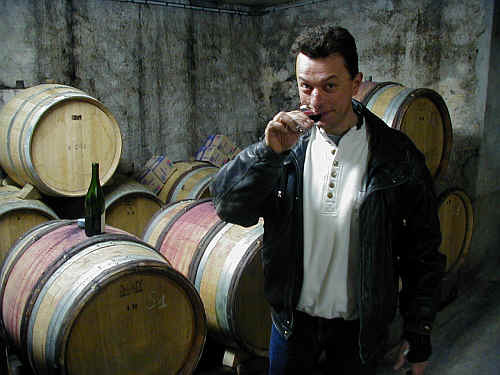 In 1979, Serge Ferigoule was hired to help in the vineyards and cellar and he ended up taking over the domaine in 1990. A new cellar was built in 2001 and many experts view this property as a reference point for the Vacqueyras appellation. The vineyards have long been cultivated in an environmentally-friendly fashion and they recently obtained certification as a "biodynamic" property. The winemaking is rather traditional and low-tech. No fining or filtering for the red wines, which are matured, typically, in puncheons and large wood tanks. If you're looking for modern Rhone wine with a lot of cedary oak, this ain't the place! 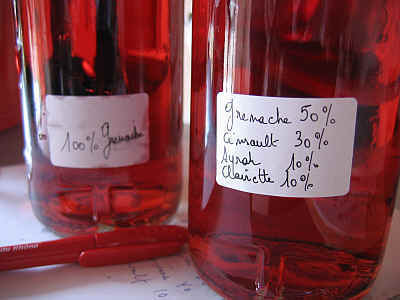 Monsieur Ferigoule names his wines after one of his three daughters. The 2009 "traditional" bottling is called Azala�s. The wine is a blend of 70% Grenache, 20% Syrah, 10% split between Mourv�dre and Cinsault. It's a fairly hefty red and one which compares favorably to a lot of more costly Chateauneuf-du-Pape wines. The 2009 is drinkable now with well-seasoned meats, especially. Using a lots of "herbes de Provence" seasoning with lamb will make for a memorable food and wine pairing. But this vintage can probably be cellared nicely for another 5-10 years, so setting a few bottles aside for further development would be a good idea. 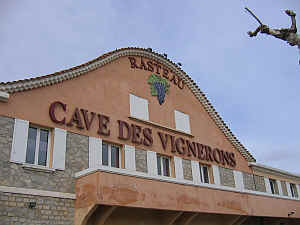 The Cave de Rasteau was founded in 1925, making it one of the oldest grower's cooperative cellars in the Rh�ne Valley. 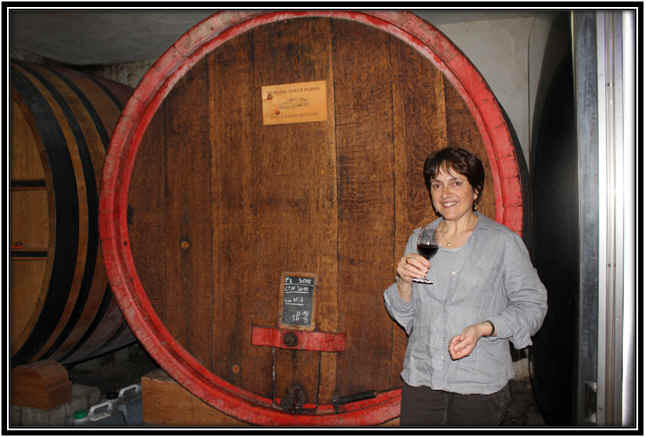 The town of Rasteau produces really exceptional C�tes du Rh�ne wines and we've found, thanks to our friend Valerie Aigron (she now works in the export department of the winery) a really nice, simply, satisfying and price-worthy red. 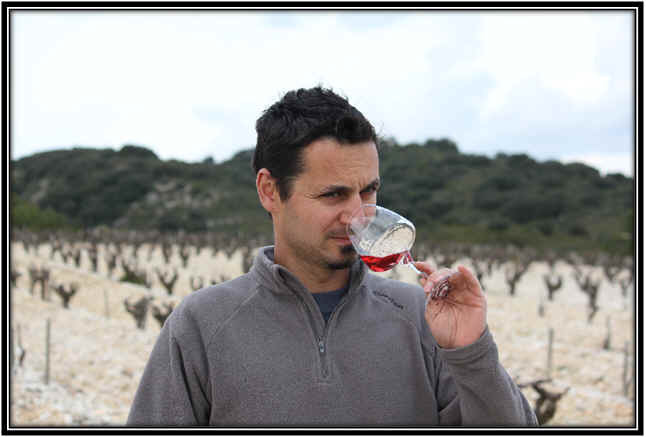 The 2014 C�tes du Rh�ne under their "Ortas" label is deep in color and displays lots of berries and spice. Grenache based and the wine shows the berry and spice of Grenache. The wine is not especially complex, being easy-to-drink and not requiring much cellaring. This is a nice wine to pair with lamb, whether you're grilling chops or braising shanks, here's a lovely accompaniment. While local vintners here in California are proud to offer Grenache-based blends for $20-$50, here's the real thing for a mere ten bucks.